Evan Saathoff has written about Tyler Perry online for years, often the lone defender of the director's amazingly strange body of work. A couple of years ago he decided to take it upon himself to write the book the world was missing: a book that examined the deeply conflicted themes, delightful weirdness and sometimes shockingly bad execution of Tyler Perry's films. 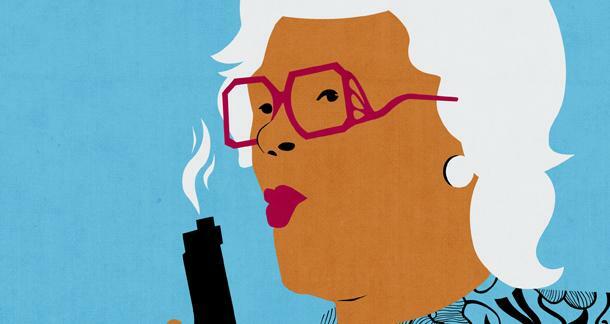 Last month Badass Digest Publishing released Saathoff's Madea Lives! A Film-by-Film Guide To Loving Tyler Perry, and the book is a wealth of fascinating and often hilarious insights into Perry's career — a must-read even for someone, like me, who's never seen a Tyler Perry film. Read an excerpt from the introduction to Madea Lives! and then read on for my interview with Saathoff below! I understand why all of my movie friends automatically hate Tyler Perry. I used to automatically hate him, too. I remember seeing Madea for the first time and just shaking my head at how stupid the world had become without my permission. Here was this bizarre, giant man unconvincingly dressed as an old woman waving a tiny, harmless gun and making millions of dollars almost exclusively off Christians. An ugly mixture of things that should not be culturally acceptable was suddenly very popular, and it made no sense at all. When you're on the outside looking in, that sort of thing inspires a lot of disdain, not just for the creation, but for the creator and everyone who supports him. No filmmaker has ever wielded such a potent combination of ambition, power, confident self-righteousness and talentlessness as Tyler Perry. To dismiss such an artist ignores an extremely rare case-study happening in realtime right before our eyes. This isn't some obscure European festival circuit filmmaker. This is one of the highest paid men in show business, and he may secretly be insane. How can you not watch? Why Tyler Perry? Why was it important to you to write this book? Had a book like this already existed, I would have just read that and been satisfied. Tyler Perry is easily the most complicated, misunderstood, and yet still entertaining filmmaker I have ever come across, and the fact that no one seemed willing to explore his filmography drove me crazy for years until I finally got fed up and did it myself. At what point, and with what film, did you realize you were seeing something in Tyler Perry's work that other people missed? The notion that people can only learn about filmmaking by watching great films is a total fallacy. You gain so much from watching someone make mistakes. Watching Diary of a Mad Black Woman for the first time was a truly jaw-dropping experience. As a character, Madea fascinated me immediately, but there's so much more going on there. I mean, Tyler Perry builds everything up to a relatively typical conclusion only to suddenly add a superfluous fourth act in which our heroine abandons her romantic narrative to literally torture a paralyzed man. I had never seen something so egregiously wrong before and I found it totally thrilling. It wasn't just bad filmmaking. That would be boring. It was something far more unique and interesting than that. What movie would you suggest for a Tyler Perry neophyte to start their journey? Always start with Diary of a Mad Black Woman followed by the two Why Did I Get Married? films. If you're still interested after all that, just follow your heart. Each movie has something to offer, so you can't really go wrong. Madea's Big Happy Family is probably the funniest Tyler Perry film, but I consider I Can Do Bad All by Myself his masterpiece. Describe a scene that's a perfect storm of Tyler Perryness. Jeez. There are so many. Why Did I Get Married Too? probably has the biggest moment of Tyler Perry insanity but I don't want to spoil it. The torture sequence in Diary of a Mad Black Woman really does have a little of everything. The torture itself is already a massively strange digression, but it's amazing how far its severity crosses the comfort line while the film confidently backs up the torturing character's actions as heroic and just. But then Madea shoots down that notion in the following scene, leaving us both shocked at what we saw and utterly confused about how we are meant to feel about it. You're not watching a Tyler Perry film if you're not morally perplexed. Talk about your process of writing the book. How'd you tackle it? I took it one film at a time in chronological order. Before writing, I'd watch each movie at least three times - one just to watch it again, one to take notes, and another to see if anything new jumped out after all that note taking, which happened a lot. After this, I pored through the notes and made an outline of topics. I wanted each chapter to have loose themes. There are plenty of things to discuss about Tyler Perry, but my goal was to confront them as they actually came up in his work. So for example, I waited to tackle the idea of Tyler Perry as a cross-dresser until the Madea Goes to Jail chapter, because that's the first movie to really treat Madea like a woman. Why do you think Tyler Perry's films are such a complicated mess of racial and gender issues? Is it willful or inadvertent on his part? When it comes to gender I very much consider it inadvertent. He definitely thinks he loves and respects women, but his displayed views are deeply anachronistic and offensive. A lot of narratives for women suffer from oversimplified, male-centric depictions, but Tyler Perry's are the only films I know of where a man can slap a woman's face out of anger and still be the good guy. Tyler Perry isn't all that interested in race. His films rarely make direct commentary on what it means to be black in America, largely because he mostly refuses to illustrate race in terms of victimization. This is actually the healthier approach, I feel. Rather than portraying black people as victims to white subjugation, he just presents people being people within their own community. In fact, his strongest racial messages so far involve bringing white people into this community rather than the other way around, which is rare and exciting. Who's an actor you'd love to see take on a Tyler Perry role? Avery Brooks 100% (Captain Sisko from Star Trek: Deep Space Nine). That would just be incredible. What's something you learned while writing the book that you'd never noticed before in Perry's films? That he's not necessarily a bad filmmaker. Occasionally Tyler Perry will pull off a really great and cinematic moment, and they usually all revolve around his utilization of music cues. I Can Do Bad All by Myself contains something like thirty minutes of musical performances, while For Colored Girls totally utilizes a musical structure. I feel like he was put on this Earth to make a full-blown musical. Why should someone who's not a Tyler Perry fan read Madea Lives? The notion that people can only learn about filmmaking by watching great films is a total fallacy. You gain so much from watching someone make mistakes. To ignore that opportunity over a preference for quality is ridiculous. We have narrative rules for a reason, and it's rare to find a filmmaker who can illustrate exactly why those rules are in place and what happens when you break them. The book explores that idea a great deal. I also think it helps those who are curious about Tyler Perry but don't know where to jump in or have trouble contextualizing what they've already seen of his movies. He offers so much material to unpack that it can be useful to have a guide through his weird and wonderful world, if only to point out why it's so weird and wonderful. I read Evan's book and watched Diary of A Mad Black Woman and it has been awesome. This is truly an unexpected and eye-opening cinematic path to start down.